Clicking on the menu will show you the history of actions done till now. Select the Action till which you want to restore so Configure.IT will revert all the changes done after that milestone. It will show you latest 20 activities / changes only as prior changes can not be undone. Click on any activity to jump to that version or use standard keyboard shortcut to Undo/Redo. Clicking on “Undo” will erase the last change done to the document reverting it to an older state. 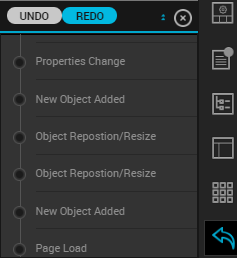 Undo command reverses the recent changes. You can go back to maximum 20 steps. Undo and Redo will work screen wise. If you switch to any other screen, then undo stack will be reset. Even if you reload the browser, undo stack will be reset. For Android, if you will perform undo, it will give effect in all resolution. As you know, this option will reverse your last Undo. So Redo can only be clicked after Undo!